Bring a little playfulness to your home this year and for years to come with these adorable Chihuahua Dangling Leg Ornaments. Each ornament is 5 inches tall and 3.5 inches wide, making it a perfect fit to any tree. 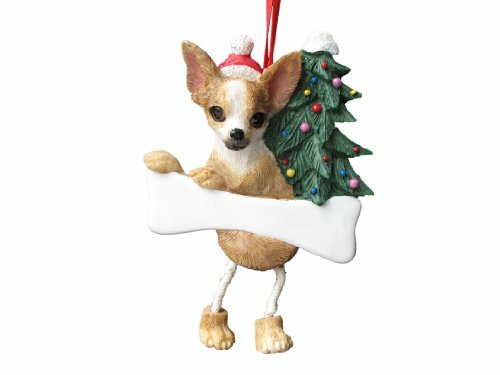 Your Chihuahua is featured next to a decorated Christmas tree, in his or her Santa hat, holding onto a bone with its adorable puppy feet dangling underneath. The bone is easily personalized with a sharpie so you can add your Chihuahuas name, the year or whatever you desire to give it that personal touch. This is a fun unique ornament and it is sure to catch eyes. Each ornament is hand painted with the most realistic detailing to every key feature of the Chihuahua. These ornaments are very artistic and particular attention was paid to capturing the unique shades of the Chihuahuas fur and facial features. Every Dangling Leg ornament was hand crafted with poly resin to ensure the durability of a great appearance and a wonderful holiday keepsake for years to come. This is sure to be one of the most adorable items this holiday season whether it is for you or as a gift idea for a Chihuahua lover you know!